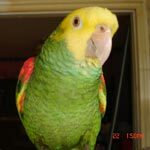 Parrot Forum • View topic - How Much Out of Cage Time? Re: How Much Out of Cage Time? stevesjk wrote: He will fly one day and you will lose him, guaranteed. I used to work at a farm store. One of the customers always came with a parrot on her shoulder. She had been doing it for many years. She said he won't fly away. But he caught a strong wind and did and she could not get him back. A parrot should only ever be taken outside in a harness or carrier, or if the parrot was professionally trained for freeflight. Everyone is telling you that you will lose your bird someday because they are correct. All you need to do is get a harness and train him to wear it and then you can take your bird outside with no worries. Hmmm, I would not say that professionally trained birds are OK with free flight... too many of them have been lost to their 'professional' trainers.